Mfantsipim School and Kumasi Girls Senior High School have topped the Boys and Girls Divisions respectively in the 2019 Sprite Ball Championship played earlier today at the El Wak Stadium in Accra concluding the two day high school basketball fiesta. 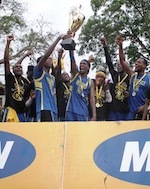 Mfantispim clinched the Boys Division title thanks to a 35-16 win over shock finalist West Africa Senior High School (WASS). The low scoring had Mfantsipim trail early on but tied the game at half time before running away with an easy win courtesy a big second half performance. On the other hand, WASS played its worst game at the worst time in the competition as the team turned the ball over on several occasions aiding Mfantsipim's fleet of fast break points. This is Mfantsipim's fifth overall title. Kumasi Girls won its second title in the competition and did so winning it in back to back years. Its latest win came via a 22-14 win over Mfantsiman Girls Senior High School after building on a big 11-0 start to become the first female team to defend its title since 2015. Mfantsipim Point Guard Samuel Owusu and Kumasi Girls Center Abigail Gyamfi were named Most Valuable Players in the competition. The winning Coaches-Isaac Mensah of Mfantsipim and Zibo Brown of Kumasi Girls- walked away with the top Coaching Awards. 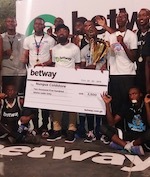 The finals were watched by top dignitaries including Ghana Basketball Association Chairman David Addo Ashong and Accra Hearts of Oak Managing Director Mark Noonan.